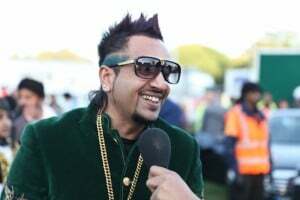 Diwali without doubt turns on the festive mood. This festival of lights brings to mind elegant décor, beautiful lights, fireworks, handmade diyas, sweets, celebration and of course colours. We cannot debunk the role of colors in Diwali. 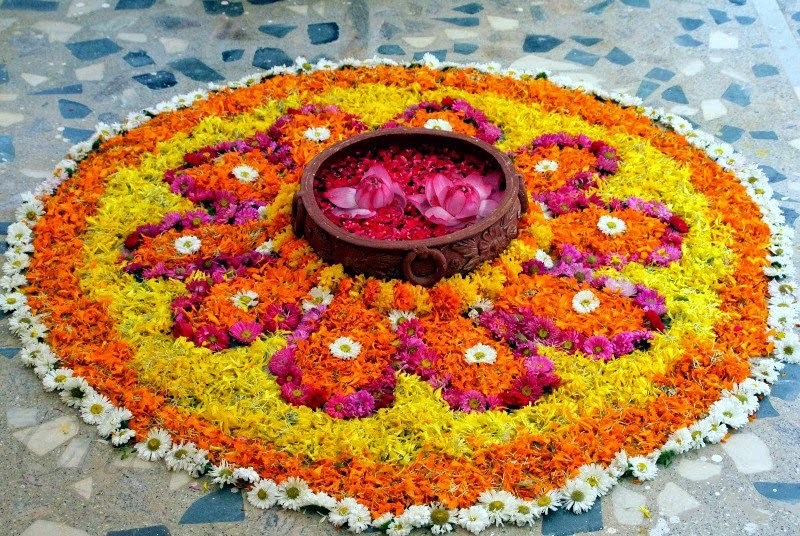 Colors give form to Rangoli, without which the Diwali décor is incomplete. Making Rangoli is indeed a joyous experience. Without going into the detailing of Rangoli, we straightway take you to some really beautiful Rangoli designs and patterns that you can try making this Diwali. These ideas will help you make a subtle piece of art this festive season. Whether you are an amateur or ambidextrous, these ideas will surely come handy when you try your hand at making Rangoli this Diwali. These designs are simple and easy to make. These dimensions have a length and width but the depth is missing. They are usually made by ones who are trying their hands for the first time as the elements are organized and do not involve a vast skill set. These patterns usually include combination of shapes, flowers, leaves etc. so if you have been good with geometry in school then it’s time to brush up the angles and get going with these kind of patterns. 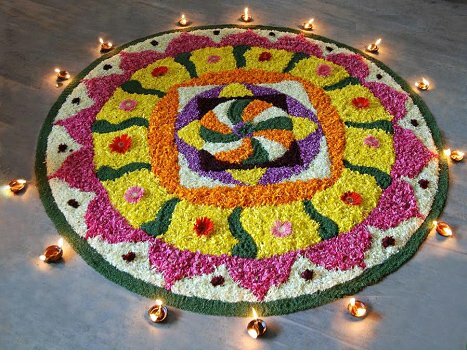 And if not, then need not worry, read on as we have plenty of different ideas to keep your Rangoli making plan intact. Coming back to this, following is a two dimensional design that is made up of a combination of ovals, semi circles and circles. Amateurs can try their hands on these as they involve less effort and skill. The look can be enhanced if you put an ornate diya stand at the center. These patterns resemble a real life object as they have width, depth and height. “3D” i.e three dimensional is what they are called. These designs are so well crafted that they give you an impression that the objects have life. These patterns require time, vast skill set and few of them might involve a lot of people. Try these patterns if you are good with sketching or have an artistic hand because these patterns do need some proficiency. Following is one such example of a 3D design. This has been made with acrylic paint. Before making such patterns it is always advisable to make a rough draft on a piece of paper and while crafting it on the floor, chalk should be used to draw the outlines on the floor before proceeding with the colours. In order to add life to these designs you can try combination of tints and shades of vibrant colours. Theme based Rangoli includes holy symbols like swasthik, kalash, deity imprints like ganpati, goddess laxmi, lotus, chakra, diyas, godess laxmi’s footprints, asthadal kamal (lotus with eight petals) , conch shells, shree , celestial and zodiac symbols, geometrical symbols, human images, animals, floral patterns etc. However, Rangoli designs are not restricted to these but are also dependent on the makers’ innovation, interest and imagination. 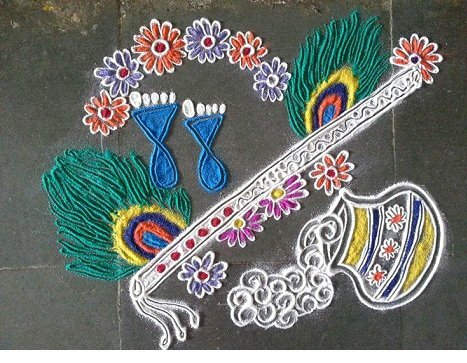 The following design is theme based and depicts the holy symbol kalash, footprints of Goddess Laxmi, Murli (Flute) of God Krishna, flowers and features of bird peacock. These types of patterns usually follow a theme. 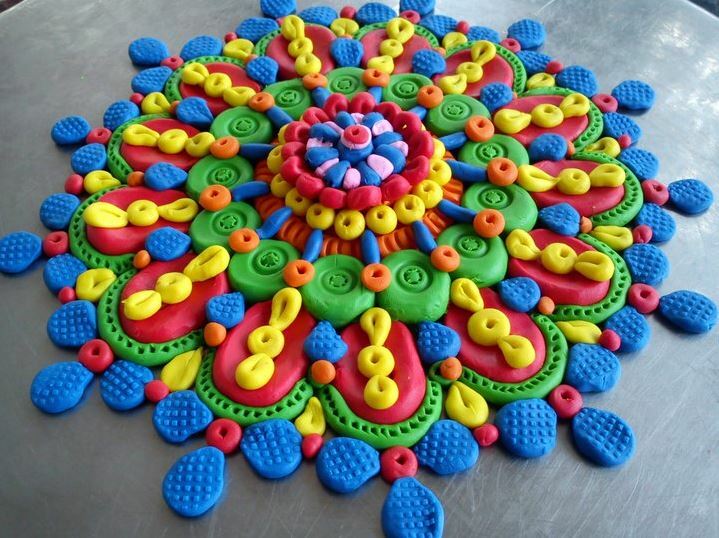 You can pick more than one theme and fuse them, add some flamboyant colours to evolve a stupendous Rangoli. There is nothing as alluring as flowers. At least I have not come across anyone who doesn’t like flowers. 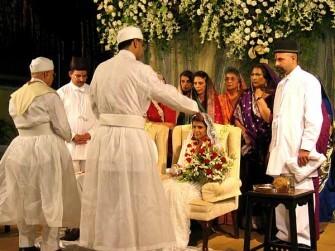 And anything that involves flowers is bound to be beautiful – be it a simple bouquet, a wedding decoration or a Rangoli. Different coloured petals of marigold, roses, chrysanthemums etc are used while making it and it can be teamed up with bark of trees; dried tree leaves powder or leaves. I prefer using powdered stone or marble powder in order to give the required brightness. You can also use Periphery of diyas to enhance the look. 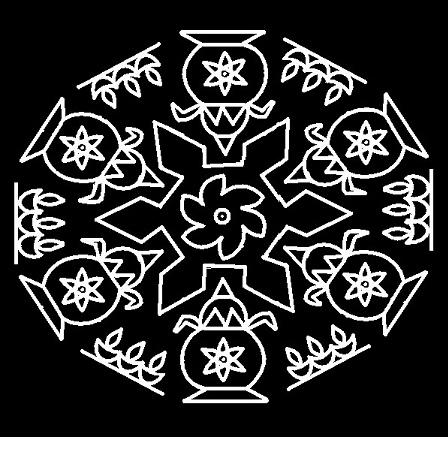 These patterns are popular in South India for making Kolam (Rangoli). The following pattern involves 21-11 Idukku Pulli (Interlaced dots). The dots are then joined and the lines are thickened. Remaining dots are then erased and you can fill the pattern with colors of your choice. The name says it all. These designs do not follow any strict pattern, the fingers move where your imagination takes them. You can use floating candles in the centre to add charisma. 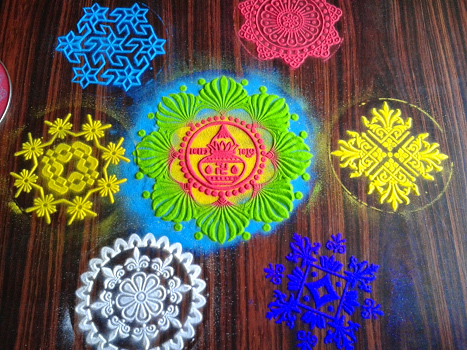 Besides coloured powder, we can use glitters, colorful bindis or marble powder dipped with colored cement. Kundan is a gemstone, which is used in making traditional jewellery but it is not restricted to jewelry making. 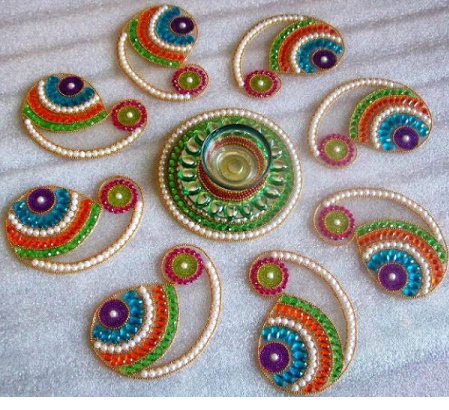 It is also used in making diwali Rangoli designs. A combination of golden beads, sequins, pearl boundaries and colourful kundan stones is used in making these patterns which add a touch of mystique. If you put a wax candle in the centre, it will add to its aesthetic look. 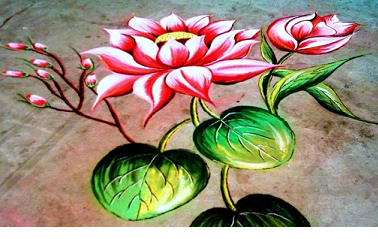 In Earlier times, only food grains and edible materials were used in making Rangoli. Ingredients like vermillion (popularly known as kumkum or roli), turmeric (haldi), salt, chilly powder are used along with wheat flour, grains, pulses, food colours, coloured rice, and rice flour while making these designs. 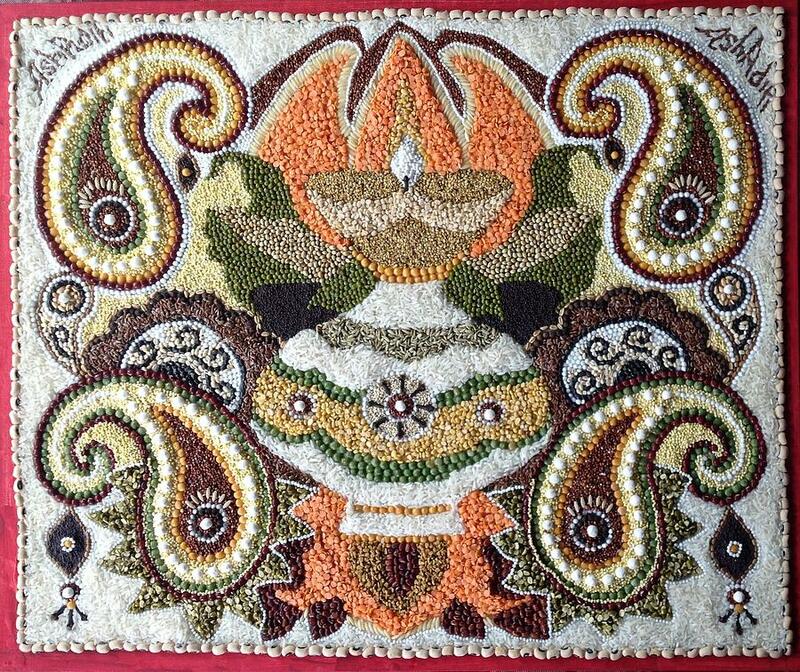 The following design uses all kinds of grains and pulses to form an exquisite Rangoli pattern. Here is another Rangoli pattern that solely uses colored rice, wheat flour, rice flour and ingredients like vermilion, turmeric powder, chilly powder etc. You may stick to the combination of two grains or can use a combination of three or four grains or more. The two patterns can also be teamed up and you can use grains and dry ingredients both in one design. These are unconventional designs and are made using clay moulds and colorful clay. All you need is lots of clay moulds, a sketch of your design and some novel approach. 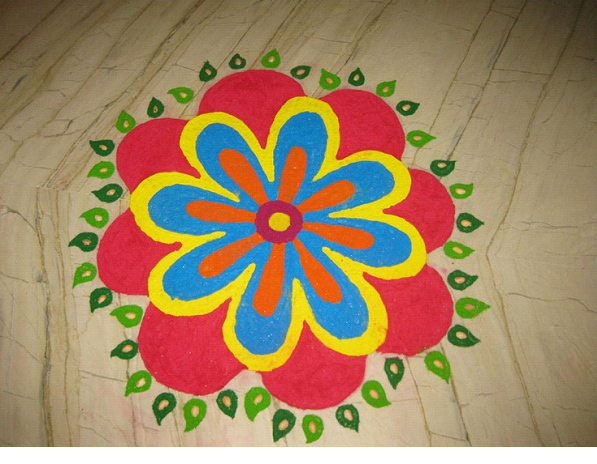 These patterns are popularly used in Rangoli competitions. These are for people like me who wish to make Rangoli for Diwali but either they don’t have the basic skills or the required patience. For drawing these designs all you need is the Rangoli pattern in form of stickers, templates or stencils which are available in stores along with Rangoli powders and colour filler box which helps in creating both précise and detailed designs with dexterity. All you need to do is place the stencil on the floor, fill it with colors of your choice and remove the stencil gently. These designs are not just easy to make but also easy to wipe. So if you are one of those people who wish to make Rangolis in a jiffy, this is all that you need. This is the newest entrant in the Rangoli design making, also popular by the name of designer water Rangoli. It cannot get easier then this for amateurs. All you need is a terracotta bowl or a crystal bowl or a Rangoli pot whichever is convenient, depending on the place where you choose to put it. Fill the vessel with water and then put in flowers or only flower petals, sprinkle some water colours, add glitters or you may also add floating candles. Now this involves some artistry. You need to have glass tiles, glass paints, few stencils, OHP sheets, glass liner and some endurance. You first need to sketch your design on different glass tiles or you may also use a stencil to draw your design. Paint it with the glass paints, let it dry and put all the tile pieces together to form an elegant piece of artsy. You can also embellish it with diyas. 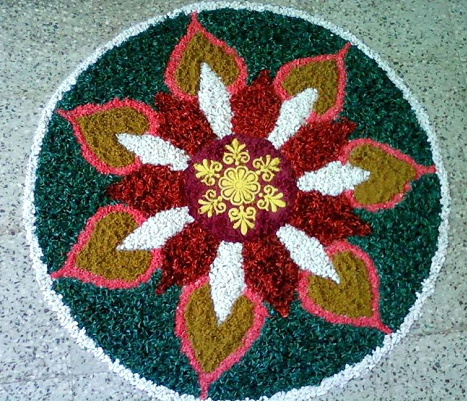 It is another beautiful Rangoli pattern that you can try using flowers and petals of various colours. 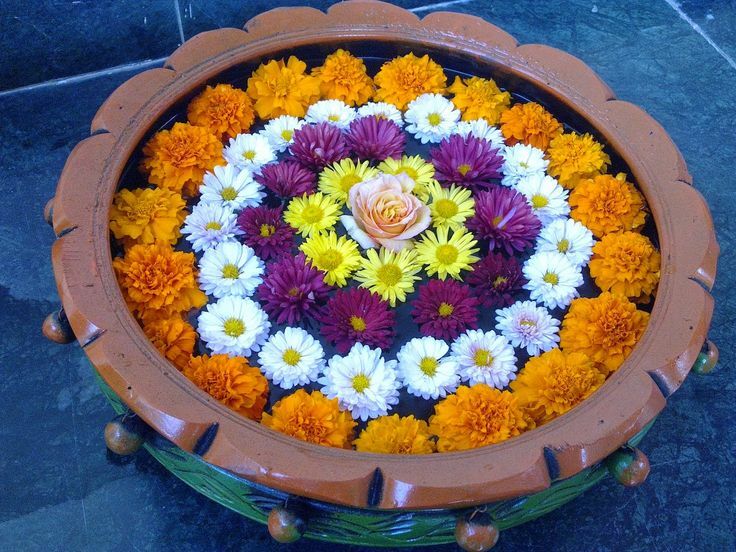 A terracotta pot at the center with floating flowers makes it look really stunning! Nothing compares a bright Rangoli depicting Lord Gnesha. This enhances the festive mood. 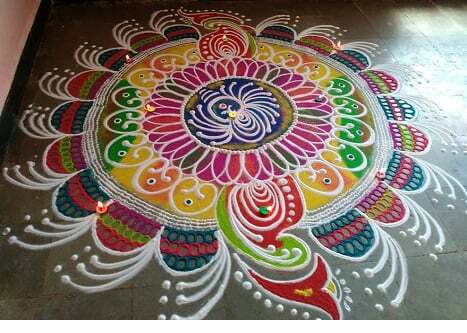 All you need is a few colours, grains and diyas, and of course, some drawing skills to accomplish this! 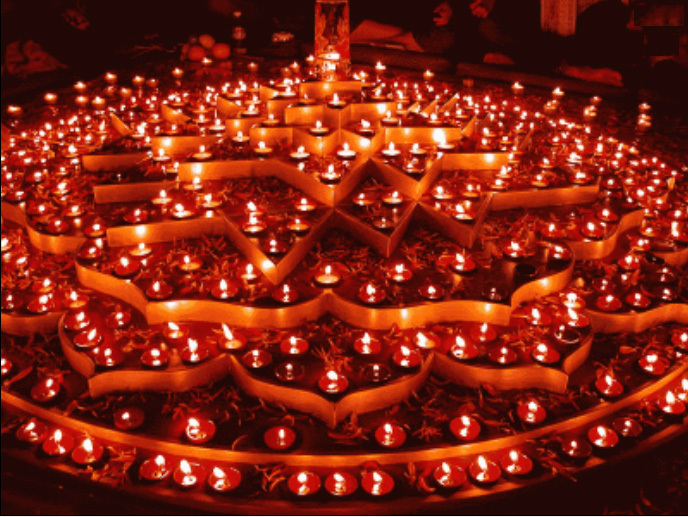 Diwali is all about Diyas and if you want to make a really nice Rangoli very quickly, this one is for you. You just need a few diyas and colours and you are done! 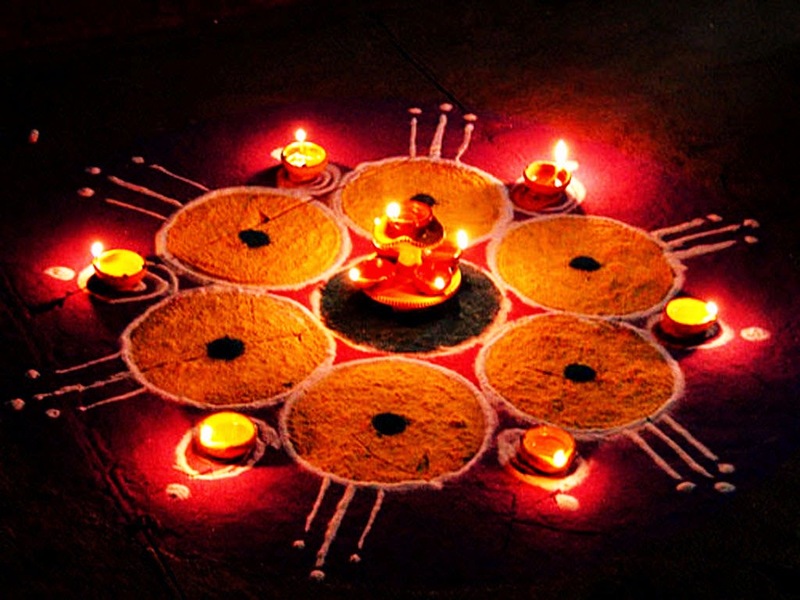 Make six circles and put colours inside the circles and place diyas in between circles. It is very quick and easy to make design – all you need is 3-4 types/colours of flowers, diyas and a terracotta or metal vessel/pot. 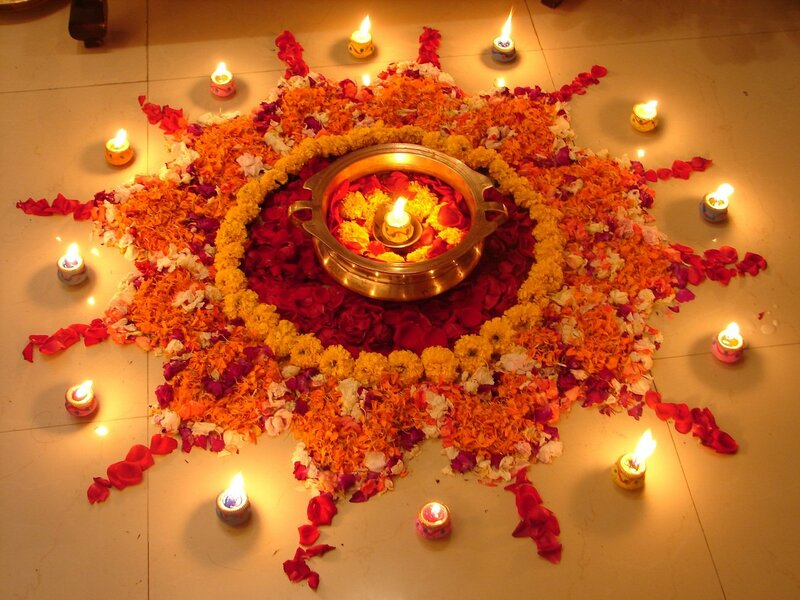 You can make a circular or radiating pattern with flowers and petals and decorate the outer side with diyas. At the center, you need to put in a floating candle in side the vessel/pot. 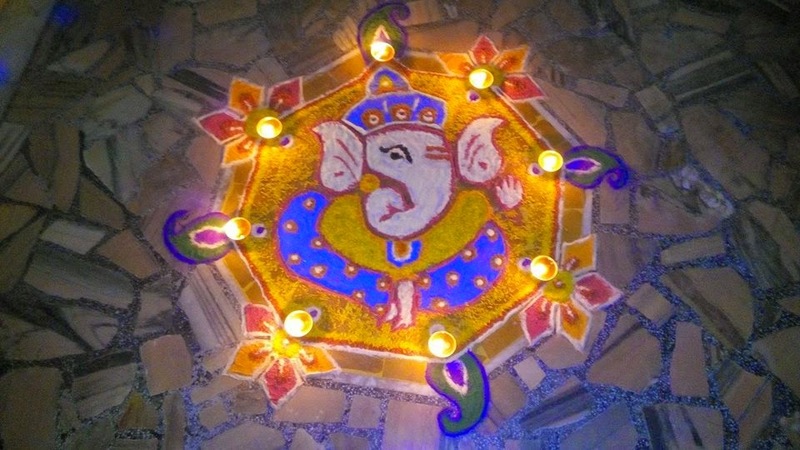 Another simple but awesome Rangoli design for Diwali! You need to make a circular pattern and inside that pattern make petal shapes to give effect to the light coming from diyas. 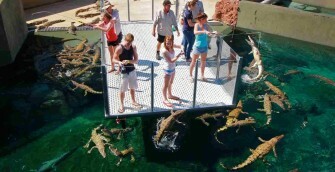 The picture below is self explanatory! 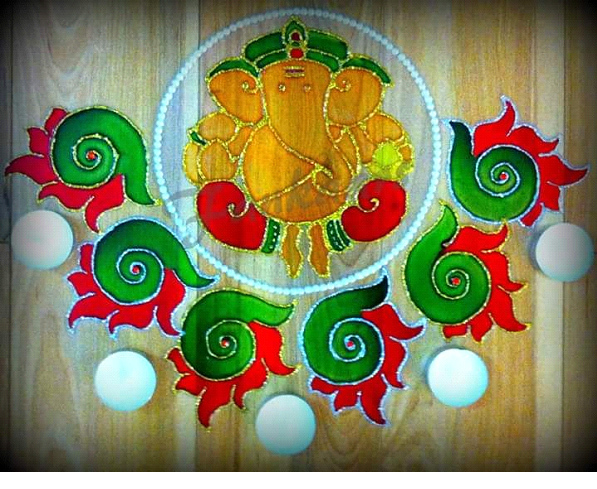 Take your Rangoli design idea a step ahead and make something very unique this Diwali. 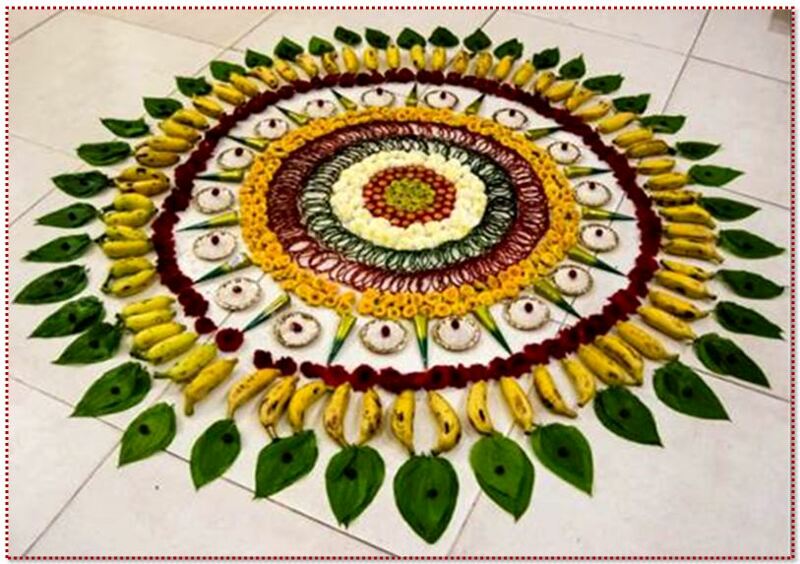 This Rangoli pattern can be made using pan leaves, banana, flowers, grains and different colour bangles. The design is very simple and does not need any great designing skill. Rangoli may not be everyone’s forte, but little patience and a bit of skill can help you make exquisite Rangoli designs. Chose patterns that do not call for a vast skill set, mix them up with earthen diyas, floating candles, ornate diya stands or periphery of diyas can also be created. So this festive season take some aesthetic sense, mix it with patience, pour in a bit of your imagination and see the exquisite piece of art work unfold.